Join the discussion on our forums! Come discuss Fiendish Circle over in our dedicated Fiendish Circle discussion topic. Very fun in Wild Zoolock with Darkshire Councilman and Reliquary Seeker. 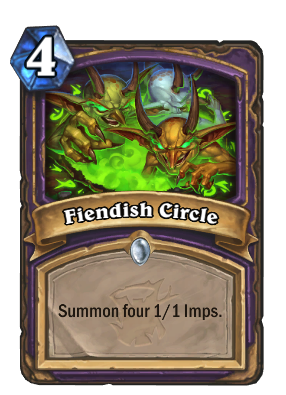 Shouldn't the Imps have artwork unique to Witchwood? I don't understand why not. For example, Whispering Woods received new art for the Wisps that was flavorful for the expansion. It seems inconsistent at the very least. I'm annoyed that this costs four and summons four imps. Four points isn't a circle, it's a square. Call in the Finishers but they're demons. I mean, sure, whatever. Why does this exist though? There is no reason why anyone needs this card to exist. 1. Arena. 4 mana 4/4 that can split its damage as you like isn't bad. 2. Wild. This card curves after playing Darkshire Councilman. 3. Future Set-up. see Call in the Finishers and Unite the Murlocs. This shows how insane Imp-losion was. That's the point. 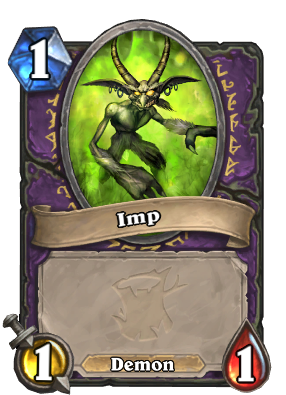 Imp-losion dealth damage and summoned imps. It was insanely over powered. Lol what? i think blizzard forgot what actually made Implosion good, Not the fact that is just summoned imps... but the fact that it did damage, this is like a high rolling IMplosion without the direct damage that made it stupid powerful. Every time I see a stupid pun, I get Blizzard to make broken Priest support for future expansions. For the sake of everyone's sanity, stop with the P U N Z !